A Treasury of Oral Instructions from the Hearing Lineage Revealing the Innermost Secret, Kachen Yeshe Gyaltsen’s commentary on the First Panchen Lama’s liturgical text, Lama Chöpa, stands as one of the great literary contributions to the Gelug Hearing Lineage. Written at the behest of the Third Panchen Lama, Palden Yeshe, this astonishing text reveals a treasury of closely guarded oral instructions. 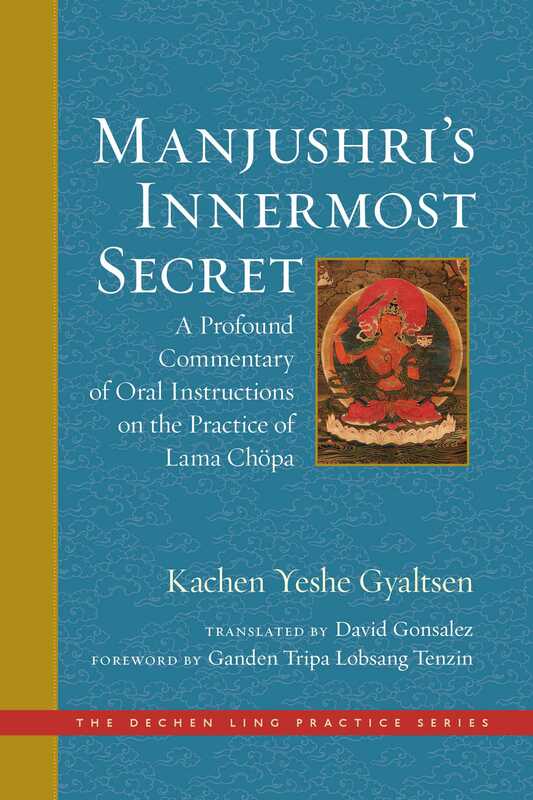 Highly informative and deeply moving, Manjushri’s Innermost Secret contains the entire path to enlightenment that was transmitted in direct communication with Lama Tsongkhapa by the wisdom-buddha Manjushri. This invaluable commentary provides an authoritative illumination of the Lama Chöpa ritual text for practitioners and is widely revered and commented upon in its own right. Designed for those who have received the highest yoga tantra empowerment, these texts swiftly guide the spiritual practitioner to the state of complete enlightenment through the full spectrum of teachings on the lamrim and mind training (lojong). It also covers the generation and completion stages of highest yoga tantra, all of which are grounded in deep, heartfelt faith and devotion for one’s spiritual guide. In addition to the Lama Chöpa ritual text itself, this book also includes the First Panchen Lama’s root text on Ganden Mahamudra, the supplication verses to the lineage gurus, and the Fifty Verses of Guru Devotion composed by the Indian saint Ashvagosha. Previously published as Manjusri's Innermost Secret by Dechen Ling Press.